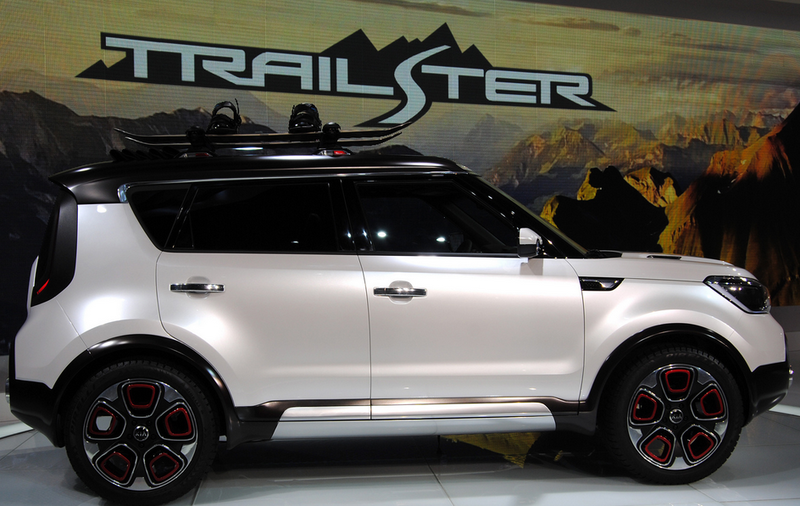 Learn about the all-new Kia Trail’ster Concept! The Kia Trail’ster concept debuted at the 2015 Chicago Auto Show and stunned the world! The Kia Trail’ster concept is a hybrid Kia Soul with some extra cool exterior styling, all-wheel drive system, and awesome off-road capabilities. The Trail’ster was built for the outdoors! On the exterior, you can find lots of LED lighting for extra illumination, snow tires with bright red wheels, a rollback canvas roof with aluminum cross rails for extra storage, and a new front bumper with aluminum skid plates to protect the exterior from the elements. A car built to tackle the outdoors has to have the engine and drive train to do so. The Kia Trail’ster is powered by a 1.6-liter turbocharged four-cylinder engine generating 185 horsepower and 185 lb-ft of torque. It contains a 6-speed automatic transmission and an “e-AWD” system. Gasoline powers the front wheels, while an electric motor powers the rear. The electric motor a rear-mounted electric contains a 1.2-kw-hr lithium-ion battery bringing the total output to 220 hp and 285 lb-ft of torque. Thanks to the start-stop system and the electric air conditioning compressor, fuel economy is expected to be rather impressive. The 2015 Kia Soul with a 2.0L engine already achieves 23 mpg city / 31 mpg highway*, and you can expect that the Trail’ster’s gas efficiency would improve about 25-30% while on the highway and 5-10% when driving in the city. The interior of the Kia Trail’ster differs drastically from what you see in a standard Kia Soul. Brown leather interior seating, aluminum accents, and glossy black paint bring more of a masculine flair to the modernized Kia Soul. While production is not set in stone for the all-new Kia Trail’ster concept, we sure do hope it eventually becomes a reality! We here at Carriage Kia would love to take one of these out for some off-road fun! For now, continue to enjoy the ever-popular Kia Soul.